TAHITI YACHT CHARTER: Take Advantage of the Recent Tahiti Charter Tax Drop – Superyachts News, Luxury Yachts, Charter & Yachts for Sale. The imposing 62m Holland Jachtbouw superyacht ATHOS is a double-masted schooner custom-made to the design by Hoek Design Naval Architects. Accommodation aboard ATHOS is provided in 5 luxurious en-suite cabins to a maximum number of 10 charter guests. She has an elegant and modern interior, boasting supple leathers, fine fabrics and a traditional flair. Her upper saloon is a great place for entertainment and socialising, featuring a large u-shaped sofa and a coffee table. The elegant dining table can be converted into two games tables, to enjoy a casual game of cards. There is also a wet bar further to port. Another great area to unwind is ATHOS yacht’s lower deck saloon, with a large comfortable sofa, occasional chairs and a custom pouf. Exterior deck areas are also ample with plenty of seating, and possibilities for al fresco dining or sunbathing. Built by the renowned Italian shipyard Perini Navi, the 50m sailing yacht SILENCIO (ex Perseus) is another magnificent yacht featuring accommodation in four deluxe cabins, two of which with Pullman berths. The full-beam master suite boasts a comfortable sitting room, which can be also converted into a private stateroom with its own facilities. The outstanding outdoor spaces aboard SILENCIO include a large aft cockpit with sheltered lounging and dining area, as well as a large and comfortable fly-bridge with al fresco dining and sun-pads. Her main deck saloon is surrounded by large windows allowing for unprecedented views of the yacht’s surroundings. SILENCIO’s interior can be described as elegant and cosy, with fine joinery in cherry wood. Charter yacht LUPA OF LONDON (ex RUSALKA) represents a spectacular Baltic 78′ yacht for keen sailors and is an exceptional performance sailing yacht designed by Reichel / Pugh. 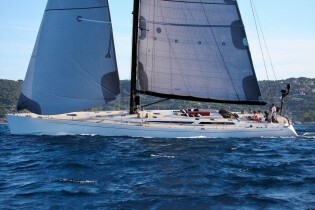 The yacht features an easily driven hull, powerful sail configuration as well as canting keel. LUPA OF LONDON superyacht offers accommodation to 6 charter guests in 3 double guest cabins. The master cabin is situated aft of the saloon and features an en suite bathroom, whereas the two double cabins are located forward of the saloon, each with a head, sharing shower. There is also a large comfortable saloon and a separate galley. Fantastic al fresco dining opportunity is offered by the large cockpit table on deck, seating all guests comfortably. Charter yacht COSMOS is a great luxury motor yacht, sure to impress even the most seasoned charterer. There are vast deck areas aboard, such as the massive bow section boasting comfortable sunbathing couch and a spa pool. Fantastic panoramic views are offered by the top deck, where charter guests can also enjoy dining al fresco. One of the main features of the COSMOS superyacht is her swimming platform situated aft, also boasting a great range of water toys and sports equipment. Deluxe accommodation is divided into three cabins, sleeping up to eight guests, however Cosmos can entertain up to 75 guests during the day; an excellent option for work functions, parties or banquets during your holiday. The three staterooms include one master cabin and two guest cabins, with a double and single bed in each. There is a further double cabin of a similar quality accessible front the swim platform only, which is perfect for staff, dive instructors or anyone requiring little more privacy. For serious adventurous the 48-metre HANSE EXPLORER might be just the right choice! She was built by Fassmer Werft with interior design by Mieske Design, providing light and functional styling, and a relaxed atmosphere. The HANSE EXPLORER superyacht is a certified ice-breaker yacht with ice class GL-E3. She is ideal for charters of longer duration and able to explorer any corner of the world. In addition to the comfort aboard she is also very safe. HANSE EXPLORER provides comfortable and luxurious accommodation to up to 12 charter guests in 7 cabins. All can be configured for either queen or twin sleeping arrangements. The master suite is located on the upper deck and includes a stateroom, en suite bathroom and a large private lounge. The rest of the guest cabins are located on the main deck, all with private en suite facilities. Another fantastic explorer yacht is MISS KULANI. She is a 2010 launched Marlow Explorer superyacht based in Papeete in Tahiti. MISS KULANI superyacht has a beautiful interior and a lovely open and airy main deck. Her main saloon boast comfortable settee to starboard with occasional chairs to port. There is also a hidden sink, a fridge and an ice maker, a bar with three stools and an entertainment system featuring surround sound and a 50’’ retractable TV/DVD as well as docking station. Accommodation offered by MISS KULANI comprises four staterooms, sleeping up to 6-8 charter guests. The owner’s stateroom is situated below deck forward, boasting a walk-around king bed, Cedar-lined hanging lockers and a vanity, as well as en-suite facilities with a sink and shower. There is also one guest stateroom with two Pullman berths (for small children only) and a queen bed, one twin stateroom and one stateroom with upper/lower twin beds, best suited for children. At 45 metres, expedition yacht BIG FISH represents yet another excellent choice for the great adventurers. She was designed by Greg Marshall Design and built by New Zealand’s McMullen & Wing in 2010. Her styling is powerful, yet elegant and accommodating. She is a fantastic example of a modern blue water, stable, functional and comfortable exploration superyacht. Her charter accommodation includes five double staterooms with en suite bathrooms, sleeping up to 10 charter guests in total. BIG FISH superyacht has a good range of water toys and equipment as well as comprehensive electronic equipment list, including audio video system, capable of storing 1200 films and thousands of music CDs. For those looking for something smaller, yet comfortable and spacious, a catamaran could be an ideal option. The Lagoon 62 catamaran FEEL SO GOOD was designed by Van Peteghem and Lauriot Prévost (VPLP) in collaboration with Lagoon. Thanks to her catamaran dual hull design, she is a very spacious yacht with generous interior living areas created by Nauta Design. The saloon and dining area are open plan, with neutral contemporary décor accented by vibrant red soft furnishings. There are also plenty of exterior living areas to take advantage of when on a Tahiti yacht vacation. The guest cockpit offers an excellent area for al fresco dining with ample seating and a bar area with a sink and a fridge. The sugar scoop transoms aft of the lower guest cockpit provide effortless water access. Wide wrap-around decks lead to the foredeck where an additional guest cockpit is perfect for private escape, followed by two large safety trampolines, ideal for sun lovers. Vision of Paradise on Earth – these are the islands of Tahiti in the French Polynesia. A Tahiti luxury yacht charter includes sailing through turquoise-blue lagoons with white sand beaches, relaxing under palm trees and exploring the underwater beauty of expansive coral reefs. Discover the islands of Bora Bora, Moorea, The Marquesas, Huahine, Fakarava, Rangiroa, Taha’a, Raiatea, Manihi or Tikehau and enjoy the freedom only a Tahiti superyacht charter can offer. Polynesian people are friendly and inviting, boasting of great love for their islands which is reflected through their music and dance. Whether you are on a romantic getaway with your loved ones or simply celebrating life with your family and friends, Tahiti yacht holiday is a perfect choice.